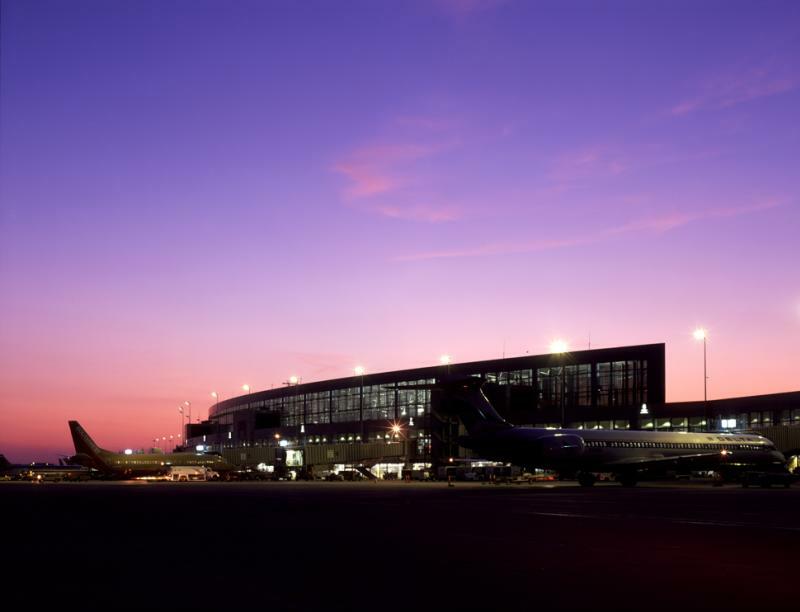 Austin-Bergstrom International Airport (ABIA) is a state-of-the-art airport with 25 gates, full customs facilities ready for the international traveler, TSA Pre-Check, Border Protection&apos;s Global Entry program and more. Easy to get to (only 7.5 miles from the Austin Convention Center) and easy to get through, passengers enjoy exceptional customer service Austin-style, free Wi-Fi (for up to 90 minutes), art exhibits, local food (from breakfast tacos to brisket and Shiner Bock beer) and 1,500 live music performances annually. In operation since 1999, the airport has roughly 350 daily flights with nonstop service to 70+ domestic and international destinations. Getting to and from the airport - and all around town - is easy. Most major rental car companies are available at ABIA, and other standard transportation options include the Capital Metro Bus Line and ride-hailing services from companies such as Uber, Lyft and Ride Austin. SuperShuttle is also available to transport passengers from the airport to locations around the city. Frequent shuttle service to downtown is available for those that want to explore Austin&apos;s many diverse entertainment districts. Find everything from trendy shops and restaurants to cool live music venues, renowned museums and galleries and scenic outdoor destinations, all within a short drive from the Austin-Bergstrom International Airport. ABIA aims to keep it local in everything they do, offering travelers the opportunity to experience the restaurants, bars and coffee shops that Austinites love. Stop for a coffee at the Fara Cafe & Sky Bar before security, offering locally roasted Nicaraguan coffee. Try your very first breakfast taco in Austin at Tacodeli, starting with the Otto smothered in Tacodeli’s award-winning salsa. Or, grab a quick and tasty juice or smoothie from JuiceLand, along with grab-and-go vegan-friendly meals. Have a longer layover? Second Bar + Kitchen offers table service, inventive housemade cocktails and small plates made with seasonal ingredients in a light and airy space. While Salt Lick continues to serve up tasty brisket sandwiches and baked potatoes to those who want one last taste of Hill Country BBQ on their way out. The new South Terminal offers a food truck park and outdoor patio for visitors to enjoy, including tacos from De Nada Tacos. Named the Airport of the Year in 2018 by ALPA, live music has been a distinguishing feature of the airport since its Music in the Air program launched in June 1999, just one month after the airport opened. What started as two performances per week has grown to 1,500 live performances in 2017 at four different venues throughout the airport: Annie&apos;s Café & Bar, Heart of Austin Bar, Tacodeli and I Vini&apos;s. All performances are free and accessible to ticketed passengers. The airport features a variety of amenities, including banks, currency exchanges, gift shops, newsstands, chair massages and more. Find everything you need for your trip, from Austin-themed souvenirs at Austin Warehouse District (Gate 9) and Yeti products at Tyler&apos;s Austin Warehouse (Gate 19) to the latest bestsellers and indie authors at BookPeople (Gate 20) and quality leather goods and designer handbags at Fifth & Congress (Gate 28). ABIA is just 7.5 miles from downtown and offers more than 15 hotels located within a 10 minute drive. If proximity to the airport is important, you&apos;ll find plenty of lodging options in the area. Explore hotels near the Austin airport and find the best accommodations and the amenities that fit your interests and price point. Get to know the area, then explore our many options and book your stay! Find more information about the airport and travel tips at www.austintexas.gov/airport. Looking for industry news about ABIA? Visit our Press Kit.